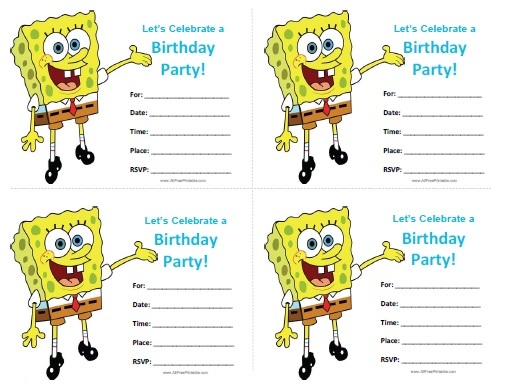 Free Printable Spongebob Birthday Invitations. Free Printable Spongebob Birthday Invitations to invite al the little friends to the birthday party celebration. Invitations from tv series SpongeBob SquarePants. Print the Spongebob Birthday Invitations using your inkjet or laser printer with card paper and cut along dotted line. Then write for who is the birthday, date, time, place, rsvp, phone. Includes Bob character and font with message (Let’s Celebrate a Birthday Party). Download the Spongebob Birthday Invitations template with 4 invitations per page. This invitation saves you money and doesn’t use much printer ink.